Dedicated to one of the most romantic places on our planet, Venetian Romance is obviously inspired by the city of Venice, one of Italy’s most popular tourist attractions. The main attraction here comes from the canals of the city, the gondolas that you can travel in and the Festival of Venice, where beautiful masks are used by people to hide their faces. Many of the things that tourists appreciate about this city are used as symbols in the game. As for the designer that created the slot, it’s called WMS. 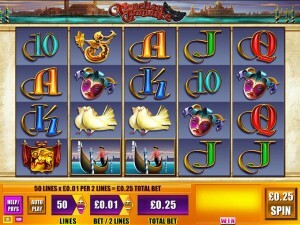 You will discover on the 5 reels of Venetian Romance that up to 50 lines can form their combinations. 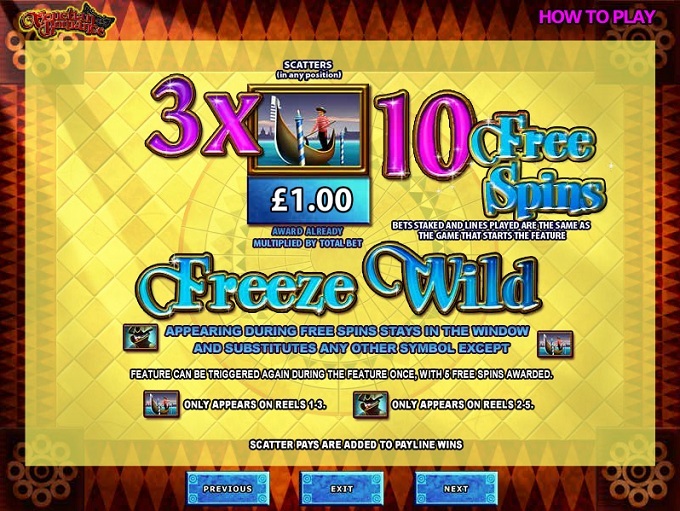 Rewards go up to $1,000 only, but besides the many chances to win you will also get the scatters, the wilds and the free spins with their frozen wilds. Symbols with special powers in Venetian Romance would be two, a wild and a scatter. The second one is the trigger for the free spins feature, which comes with freezing wilds. The Masked Man is going to be the wild feature that you will count on to get new combinations formed, even if you don’t have all the symbols that would normally be needed for them. The wild acts as a replacement for a missing symbol, provided that you’ve landed the wild in the right spot, where the other symbol was needed. The wilds only appear on reels 2, 3, 4 and 5, so don’t expect it to be able to form a regular combo. On the other hand, we have the scatter symbol, showing the image of a Gondola on it. 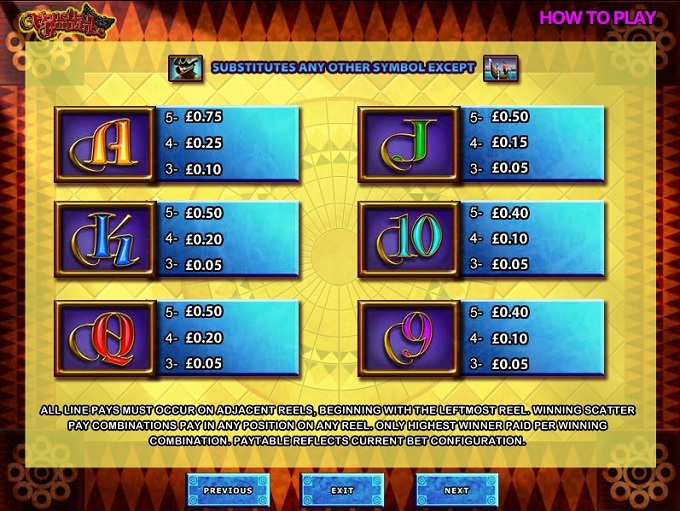 Used on the first three reels of the slot, it has to appear on all three at the same time in order to get you the 10 free spins which are offered, along with the prize worth 4x the total bet. Getting the Masked Man wild during free spins will make it freeze into place, to be used again in the rounds that follow. 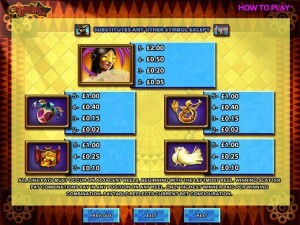 Retriggering the free spins is done only once, where 3 scatters bring you an additional 5 rounds. 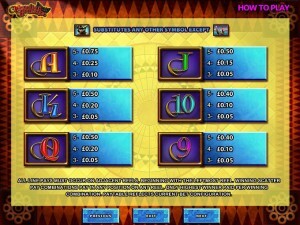 Luckily, the game needs only half of the symbols which would normally be reserved for 50 paylines. Each coin you use can cover two paylines, so the largest bet has 25 coins in it. The value of the coins starts at $0.01 and can reach $5. The resulting bet goes up to $125. The slot’s rewards are a bit of a letdown, offering 200 coins, so only $1,000 at best. 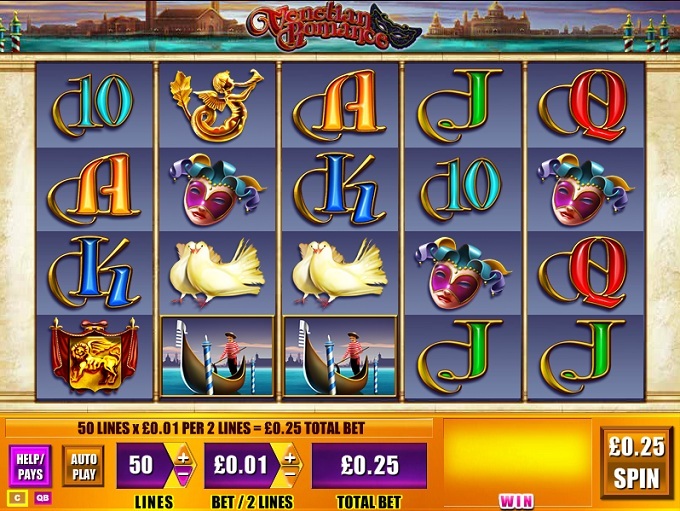 As you can expect in a slot machine inspired by such a beautiful city, the graphics are very attractive. Venice is shown at the top, a view from the sea, so you don’t actually see the canals in it. The reels are filled with beautiful symbols, and I’ll even use that word when it comes to the poker cards, which are shaped in interesting ways. The rest of the symbols are with masks, gondolas, heraldry images, doves and other images that Venice has to show you. 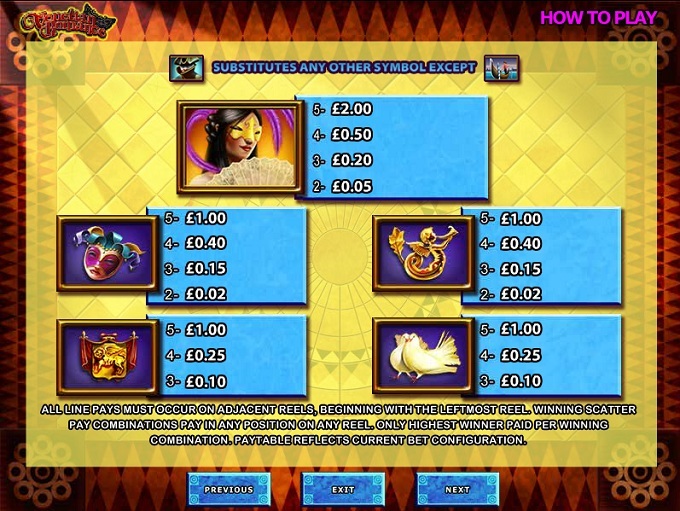 Symbols: Masked Man (wild), Gondola (scatter, 4x total bet), Masked Lady (200 coins), Mask (100 coins), Golden Trumpeter Decoration (100 coins), Heraldry Logo (100 coins), Doves (100 coins), Ace (75 coins), King (50 coins), Queen (50 coins), Jack (50 coins), 10 (40 coins) and 9 (40 coins). The beauty of Venice does a lot for this game, as its graphics have something extra to offer you. The features are at least OK, but the prizes will be quite low, even accounting for the large number of paylines. You will find Venetian Romance at any online casino which chooses to use software from WMS, playable either for free or for real money.